It is quite a process to put on a real nun habit. (And we don't just mean waking up at dawn to start your days.) Their outfit is quite elaborate. They use safety pins to hold the coif—a close fitting white cap, to the wimple—a traditional piece to cover the neck, to the black veil. All of these things are pinned together to keep them from coming loose. And of course the black tunic, held secure by a belt. This is a very well made and good-fitting outfit. I was surprised by the quality and fit. I am almost 6 feet tall, and it is long enough for me. 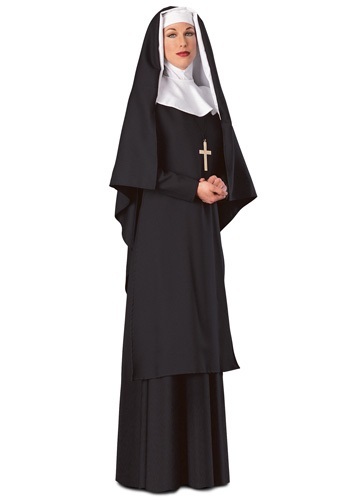 I usually wear a size 8-10, so I ordered the Medium and it fits great -- could even be taken up a bit, but it's a nun costume, so I don't care if it's loose. The shoulders fit perfectly, and the arm length is just right. The material is not flimsy and the construction is good. I may take up the head piece a bit, since it it is loose around my neck, but that's easily done. All the parts are well made and sturdy, as well. I love it! Now to accessorize! Hail Mary, what a great costume!!! Quality is above average. Fit is above average. Great costume. Will use it more than once.